So the Democratic Republic of Congo's long-awaited presidential election campaigns are finally here. Outgoing President Joseph Kabila must be feeling rather happy with himself and with the way things are going. There was a time when he had become a villain of sorts, with everybody believing he was bent on clinging on to power, come what may. Then he pulled the proverbial carpet from under his critics' feet. At the very last minute before nominations for presidential candidates closed, he unveiled the official candidate of his party, the People's Party for Development and Democracy and its collection of allies, the Common Front for Congo (FCC). He wasn't one of the big boys whose names had been floated by experts and casual commentators. Kabila went for a candidate, Emmanuel Ramazani Shadary, whom some have flippantly dismissed as an unknown but who, as a former provincial governor, deputy prime minister and interior and security minister as well as the ruling party's permanent secretary, is anything but. Adding to his visibility is his fairly recent targeting for sanctions by the European Union on charges of human-rights abuses linked to the incarceration, torture and killing of political activists and opponents of the government. Meanwhile, pundits in the media suggest Shadary will have difficulty defeating a candidate or candidates fronted by better-known and wealthy opposition figures such as Moise Katumbi, former governor of Katanga Province, and former rebel leader Jean-Pierre Bemba. This seductive reading of the situation ignores the extent to which the government and the ruling party and its allies have gone to ensure that candidates on the other side go into the campaigns literally with their arms and legs tied. Perhaps the most potent of the manacles with which they will have to contend is the shockingly short campaign period. In a country as vast as the DRC and with its physical infrastructure as dilapidated as it is, the government seems to think that only a month is needed for the campaigning, during which candidates are expected to traverse its entire territory. They may have the financial resources necessary to surmount this particular obstacle, and this in itself is debatable, but it is unlikely they can put together the logistical operation to pull off a credible campaign within four or five weeks against a ruling-party candidate with government support at his disposal. It is the kind of situation that allows one to imagine that even a billy goat dressed in ruling party colours would win the elections. So, come December 23, I would bet my money on Shadary being declared the new president and the opposition crying foul, and rightly so. Meanwhile Kabila, whose future plans remain the subject of much animated discussion, will be having the last laugh, having outmanoeuvred almost everybody, including the international community who had seemed to want to ensure they had a say in what happened. The outmanoeuvring of the international community, however, will not be without its own cost. This becomes clear when one considers the specific steps Kabila took to keep them at bay. He very smartly cloaked himself and to some extent his government in nationalist garb, which manoeuvre he used to reject money offered to the government to help preparations for the polls. Of late, the rumour mill in Kinshasa has been churning out stories about this, one of which is that some international actors or their agents or collaborators have been "pushing" the government to accept financial assistance towards funding the elections. The government has so far been playing hard to get, and has gone ahead and injected a few hundred million dollars of its own money. The trick is to ensure that it retains the space it needs to "manage" the process in its own way, without outsiders snapping at its heels and hectoring it to do this and that. 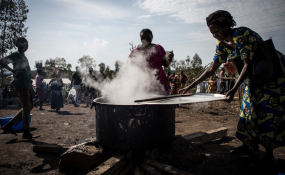 There is some debate regarding whether the rejection of outside help is clever, whether it can last to the end (jusqu'au bout), and whether it won't hurt ordinary Congolese whose immediate needs the government continues to neglect because "there is no money." This debate raises some important questions, not only about politics in the DRC, but also elsewhere on the continent. One is what price we ordinary citizens pay for politics in general, and for competitive elections in particular, and whether it is a fair price. The other is why we hold elections of the kind we are unable to finance without eating significantly into national coffers and rendering governments unable to a significant degree to respond to citizens' immediate needs. Yet another is why international actors insist on pushing for forms of politics in Africa that they know governments have no capacity to finance without external help and the manipulations such help makes possible. These questions flooded into my mind after I heard that, while the Kabila government was being smug about rejecting external assistance, large numbers of public servants had not been paid salaries, and pensioners had not received their pensions. I would have loved to ask some of them what they thought of the political manoeuvres going on around them. Frederick Golooba-Mutebi is a Kampala - and Kigali-based researcher and writer on politics and public affairs.